Here are a few photos from the AQT in Campbell County, TN. I took these a few months ago and just realized that I'd neglected to post them. For those who don't know, the AQT stands for the Appalachian Quilt Trail. 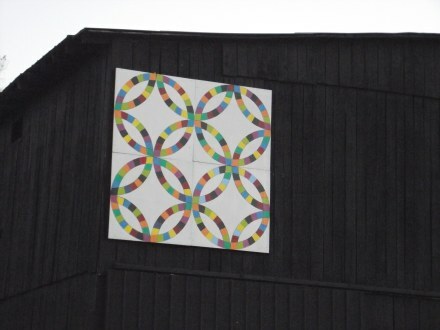 It's a collection of brightly painted panels that grace barns and other buildings. Each one has meaning in Tennessee.These are wood panels that have been painted to represent quilt panels or squares. Quilt panels can represent traditional patterns or newer ones that are specific to the Appalachian Region. The quilt panel in the photo to the left is one of the ones on the AQT in Campbell County, TN. We found this one on the Heatherly Barn in LaFollette. It is a double wedding ring quilt panel. According to WomenFolk.com the design may have been brought to the U.S. by settlers arriving in the 17th century. The one on the left with the green, white and brick colored pattern is called Churn Dash. It's on the site of the O'Bryant Country Store at 526 Old Middlesboro Pike in LaFollette. The name for the quilt panel design is Churn Dash. It's said to be taken from everyday farm life and is fitting for life in this part of Appalachia. In reality, this square is brighter than it appears in the photo. It was nearly dark when we found this square on the AQT in Campbell County. It's on the Harris Barn in Speedwell at 1311 Doakes Creek Rd. Color Wheel is the name for this pattern. It's one of the newer patterns to emerge in the past several years. The colors are bright and can be seen from a distance. 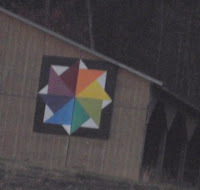 Many of the quilt panels that are on the trail are easy to find. For others, you will want to use the map that's found in the Appalachian Quilt Trail brochure. It's available for free online by clicking through this link. Even with the brochure there were moments when a Google map helped us out. It may be helpful to input all the addresses into your favorite mapping program for the squares you want to see on the AQT in Campbell County. This may help to better plan your route when you visit. I'm going to try that when I do some more exploring in the spring. It's worth the effort. The name for the design on this orange and white panel is Hunters Star. It graces the Billy Hunter Barn at 217 Middlesboro Hwy. in LaFollette. If you are from anywhere in East Tennessee you'll recognize those colors. This is one of the quilt panels on the AQT in Campbell County that blends current history with age old traditions. All I can say is "Go Vols" and feel a little sorry for you if you don't recognize the significance of orange and white. If you want to learn more about the quilts of the region come visit the AQT in Campbell County for yourself. Otherwise, you may want to take a look at A People and Their Quilts by John Rice Irwin.